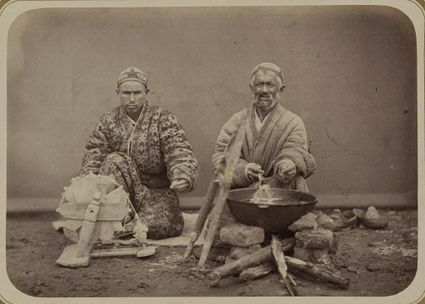 This photograph was taken in Turkestan in 1862. The men are reeling silk. The older man on the right is boiling the silk cocoons and feeding the silk strands up over the wooden frame leaning over the pot. The younger man is guiding the strands (if you biggify and look closely, you can just make out the thread running through his had) onto the charkha for winding.